One of the most fun things about traveling to a foreign land or moving to a new place is discovering new and tasty foods. Living in a new country, I occasionally see vegetables that I haven't tried before. Perhaps they look familiar and yet a bit strange, like the pointy cabbage called spitskool I wrote about last week. Lately I have seen nice weedy looking greens at my local farmer's market. They weren't labeled with a name and I didn't ask what they were. But of course, I bought them. I ate them. I had no clue what exactly they were but they tasted fresh with a slight bitterness. 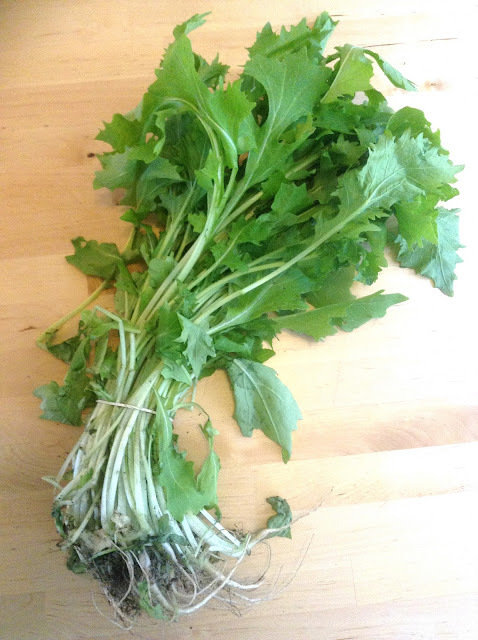 I thought they might be a cultivated milder variety of dandelion greens. Yesterday I saw the greens again in my organic grocery store. But this time they were labeled with a little sign. Raapsteel. Well, hmmm. The adventure continued as I have no idea what "raapsteel" is! A quick visit to google tells me raapsteel translates as turnip green. But I tell you, I see the roots and there are no turnips attached. It is likely one of the closely related Brassica rapa varieties including mizuna, mustard greens, and rapini. I am a huge fan of rapini and mizuna so I am very happy to discover a new variety to stuff in my pie hole. What about you? Discover any new fruit or veggie lately?